Perfect spot apart from the cheapskate repair ! Lovely area, try and find It’s mate in Salares ? I was quite shocked to see the cement repair – what a shame. What a lovely spot, but I so agree with you about the cement repair. Very lazy indeed. The bridge is in a secluded spot, 1km away from the village, and the only access is on foot. The oleanders were truly spectacular en route, Sylvia. I hope the bridge gets repaired in time, to restore it to its former glory. Thanks for your comment – always much appreciated. 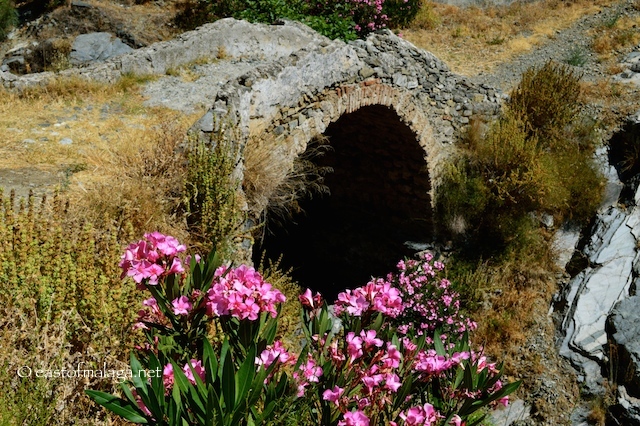 Beautiful photo of this Roman bridge! ….but have you noticed where the bridge has been repaired, Sue – with cement!! What WERE they thinking? In March I hiked with 30 other hikers over this bridge on a 4-day Charity Hike from Periana to the Nerja Caves along the new Malaga Gran Senda trail. We hiked four segments, staying the nights in the mountain villages along the way. Fantastic scenery and history! How wonderful, Ron – well done! Very pretty scenery around Sedella, Salares etc – not an area I know well, but will be making a return visit very soon to explore further. I saw all the pictures at facebook, Very nice and very good. The bridge is Sedella is very nice at a beautiful spot.I like sedella because it is so calm………..
Lovely shot. I like the way that the swathe of Oleander appears to mirror the arch of the bridge. what a great splash of brightness against an otherwise neutral landscape. ☺ I love old bridges!